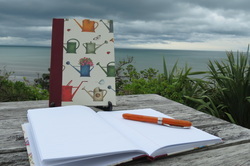 Cloggyart manufactures hand bound journals. For the inside of the journals we use paper from exercise books (the 1B range). The journals usually exists out of 4 signatures of each 12 double pages stitched and glued together. The outside is made with 2 mm grey board covered with various types of design paper. For the spine we use different colours of strong linen. Our journals are also well known for their map covers. Buy a journal which has the map of your favourite area in the world on it. Cloggyart also restores books of which the cover has come off or are damaged otherwise. You can find examples of books that we have restored on the page "restoration". We also bind your treasured periodicals (Donald Duck etc) into compact year books. This prevents them getting lost but also enables you to position them proudly on your bookshelf. To prevent them from damage we can make a case around.